Echo City awaits . . . 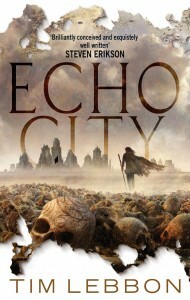 This week sees the release of ECHO CITY, an atmospheric dark fantasy from New York Times bestselling author Tim Lebbon. Described by Steven Erikson as “brilliantly conceived and exquisitely well written” ECHO CITY explores the consequences of a stranger’s arrival in a society where the outside world is no more than a myth. Echo City lies at the heart of a poisonous desert. It is a place ruled by tradition, where history has been forgotten and the secrets of the past are little more than echoes beneath the dusty streets. The inhabitants of this labyrinthine metropolis know but one truth: they are alone in the world. No life exists beyond their walls. So when a stranger from beyond the desert arrives, everything they’ve believed in is suddenly proven false. As centuries of tradition and stasis come to an end, different political groups prepare to fight a war for the future of their city. Yet soon they will face a far greater threat. For unknown to them, an ancient force is awakening in the darkness below Echo City . . . and soon it will reach the surface. ECHO CITY has already received considerable praise from both print and online media. For a taster of what is one of the fantasy releases of 2011, check out this exclusive extract.